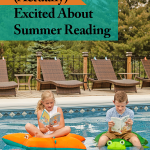 I read this article and wanted to share it with you: How to Get Kids (Actually) Excited About Summer Reading https://blog.sonlight.com/summer-reading.html. Four children and a little sleep deprivation later, I've relaxed many of my standards. (Anyone else have a crawler who regularly helps himself to stray cheerios off the floor?) However, my belief in the power of helping my children love to read hasn't changed a bit. We all know reading is important for our kids, but our best intentions often run into this thing called real life. As you gear up for summer, here are seven ideas to set you up for success in lighting that reading fire. The dog just might spark a love for reading in your child. Having your kids read to a pet is not only a fun way to motivate them to read, it also gives them a patient and nonjudgmental audience. Of course, if you don't have a dog, a willing cat, hamster, or even chicken will work. Research shows that reading to a dog, even 15 minutes a week can dramatically improve reading fluency. In a ten-week study by the University of California, kids increased reading fluency by 12-30 percent. Take a look around your home. Does every chair face a TV? What activities does your living space encourage? Try this challenge: Set up at least as many comfortable spaces to read as you have screens in your home (phones included). Start by thinking about where your family gravitates. Choose something decorative to hold a selection of books and make that space comfy. Don't forget to keep books in the car and the bathroom. You could even have your kids build a reading fort! I was inspired by my local library to use shallow wooden book crates for my kids. I keep these in strategic locations around the house, filled with books I know they'll love. My kids can rifle through the crates, see the covers, and put the books back easily. This (almost) solved my problem of the always-messy bookshelves. Even my pre-readers spend hours splayed out on the rug "reading," partially because the books are right on their level. 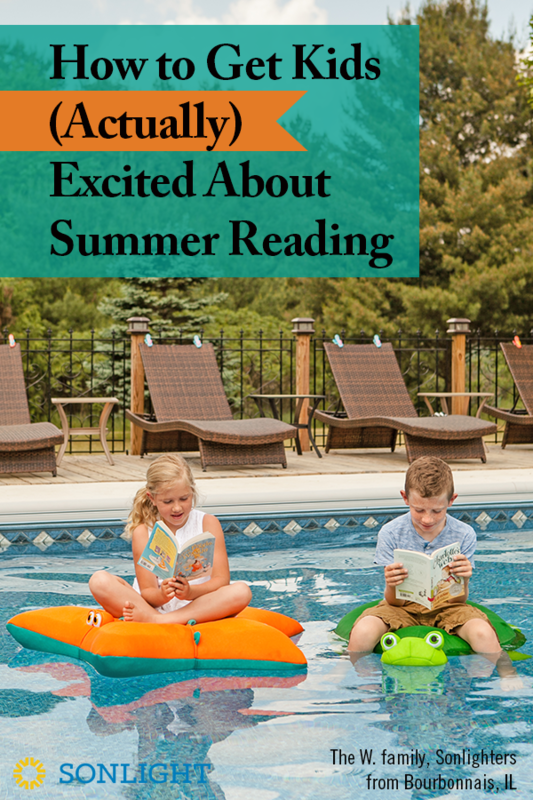 As you think about making space for reading, consider making space in your summer schedule as well. If you have no margin and rush from one activity to another, you won't have time to relax with a good book. Clear a spot on the calendar and take time for reading! Listen to Your Doctor. Dr. Seuss, That is. 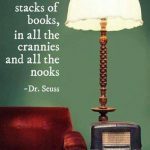 Turns out Dr. Seuss had it right when he said "Fill the house with stacks of books, in all the crannies and all the nooks." 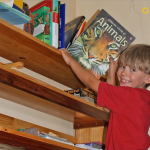 A recent study shows that if you want to boost academic performance, the best thing you can do is build your home library. The results—gathered from households in 42 nations—were clear: “Regardless of how many books the family already has, each addition to the home library helps children do better (on the standard test),” said Mariah Evans, sociologist and research team lead. Bonus: Home library=no late fees. Have your children ever caught you eating chocolate and not begged for some, too? The same thing happens with books, but with less mess and fewer calories. When my kids see me enamored with a book, they naturally mimic this behavior and get a sense that reading is what we do. This mirroring of behavior actually happens at the neurological level. 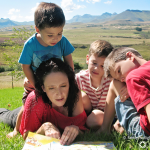 Even when you are reading, your child's neurons are firing as they learn to imitate you. 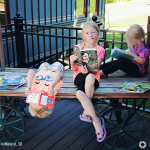 So while you put your feet up to read a good book this summer, you can pat yourself on the back that you are busy modeling a lifestyle of learning for your children. Ah, sacrifice! Even if you take a break from school for the summer, keep reading aloud. Whether you do this over breakfast, after swimming, or before bedtime, reading aloud is one of the best ways to bond with your children, increase vocabulary, and generally help them love books. So don't stop! Cuddle on the couch and enter into new worlds and adventures side by side. 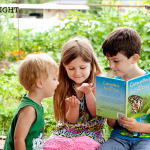 You want your kids to see reading as a part of your family DNA, not merely a school thing. Can you believe that 42 percent of college graduates never pick up a book again after graduation? They got the degree, but they missed out on making the joy of reading a natural part of life. We want to raise children who will value lifelong learning, who see books less as duty and more like friends. The type of book you hand your children makes a huge difference in their inclination towards summer reading. Just what makes a great book? If you want your kids to fall in love with reading and to establish a mental database of good language patterns, they need books with compelling plots, interesting characters, and beautiful writing. Choose premium fuel for your kids' minds and hearts. After nearly three decades of book reviewing and choosing, Sonlight founder Sarita Holzmann, knows a good book when she reads one. (You can read about Sarita's All-Star Test for choosing Sonlight books here). In the search for the best books, Sarita and the Sonlight team comb through hundreds of pages of catalogs for promising titles, and read or review about 214 books a month. And those books aren't preschool picture books, but 214 chapter books. So just in the last year, the team reviewed around 2,400 books. Whew! If you want to spark a love for reading, but don't think you'll have time to review 2,400 books to find the best of the best this year, we'll do the hard work for you with the launch of this season's Sonlight Summer Readers. 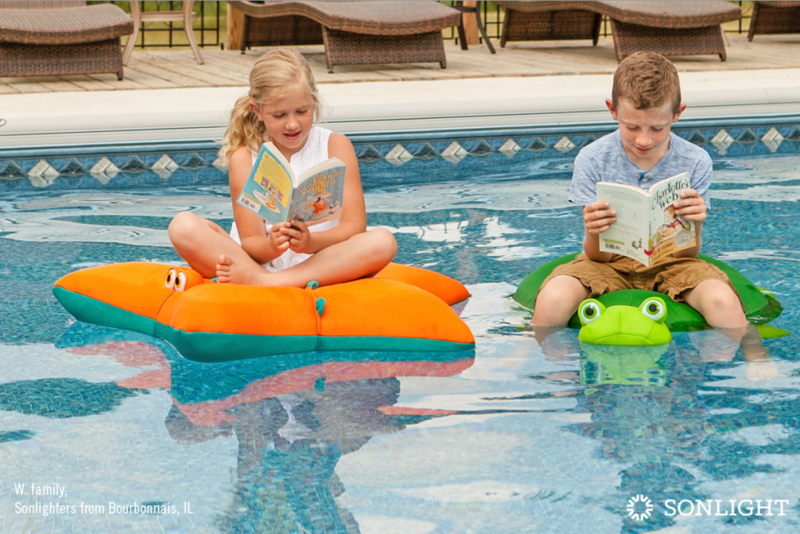 Our hand-picked summer reading packages are grouped according to gender and grade range to help you find the set that's sure to get your child excited, and each package comes with a built-in discount. You'll also find a variety of genres. You may be surprised to find a new favorite author or books series you might never have picked yourself. So if you're trying to build your home library for summer or any season, check out these high quality, twaddle-free, wholesome books that follow the Philippians 4:8 principle. These page-turners are truly fun—the type you'll have to pry from kids' fingers at lights out. Now that's summer reading at its finest.